‘The Painted Veil’ is a moving romantic drama set in China in 1925, and based on W. Somerset Maugham’s critically acclaimed novel of the same name. This is a truly timeless story about the values of love, marriage, fidelity, understanding, etc., while also exploring a clash of cultures, to name just a few dominant themes. Directed by John Curran, this film is, arguably, the triumph of a book-to-film adaptation. ‘The Painted Veil’ tells the story of Kitty (Naomi Watts), a somewhat spoilt young woman with a menagerie of admirers. Her mother is desperate to wed her before her younger daughter. When Kitty’s father invites Dr. Fane (Edward Norton), a prominent bacteriologist and civil servant into their home, he instantly falls in love with Kitty. Feeling pressured, Kitty marries Walter Fane “to get as far away as possible from her mother”. Walter and Kitty then travel to Shanghai, where Kitty falls in love and has an affair with charming, but “happily married” Charlie Townsend (Liev Schreiber), a British Vice Councillor. When Walter is offered the position of a doctor in Mei-tan-fu, a small village in China and the centre of a cholera epidemic, he makes the ultimatum to his wife: either she travels with him to Me-tan-fu or he is divorcing her for adultery. Walter then softens his condition, agreeing to divorce Kitty quietly if Charlie Townsend marries Kitty. When Charlie refuses to divorce his wife and marry Kitty, she has no choice but to drag along to Mei-tan-fu with her resentful and punishing husband. In the village, Kitty and Walter start to see each other and their marriage differently, and this leads to some unexpected results. The caption to this film reads “sometimes the greatest journey is the distance between two people”. This is what this film (novel) is all about – bridging the gap between two seemingly different people. Although the film goes through the paces of the already done-to-death theme of “love blossoming in the background of crisis and disaster”, the film is never tiresome to watch. In ‘The Painted Veil’, the audience becomes engrossed with the main characters’ feelings and emotional states. In particular, Kitty’s emotional, psychological transformation is fascinating to watch, as she discovers a new way of life which is different from her usual representation of it. Kitty’s journey of self-discovery also opens a new side of her: she starts to understand her feelings towards her husband better and starts to discover qualities in him that she never knew existed. What is interesting here is that the audience can sympathise with both Kitty and Walter, despite their contradictions with each other and different points of view, for example, with Walter’s “heartbroken” position taking into account his wife’s infidelity, and with Kitty’s desire to be happy and safe. In the film, Walter and Kitty reach the stage where they start to understand and accept each others’ differences. In spite of these differences, they also start to realise that they can still enjoy each other company and find necessary compromises where necessary. The qualities which they do not have within themselves, but clearly see in each other, soon become the objects of inspiration and admiration for both. Here, the title of the novel becomes very relevant. It is as though Walter and Kitty in their marriage are “behind” some painted veil. In the beginning of the novel, both of them do not want to accept each other for who they truly are, and, therefore, try to mould each other as their tastes dictate. The title may also refer to Chinese people living in Me-tan-fu village, who, despite the cholera epidemic, still do not want to acknowledge and accept fully this fact. 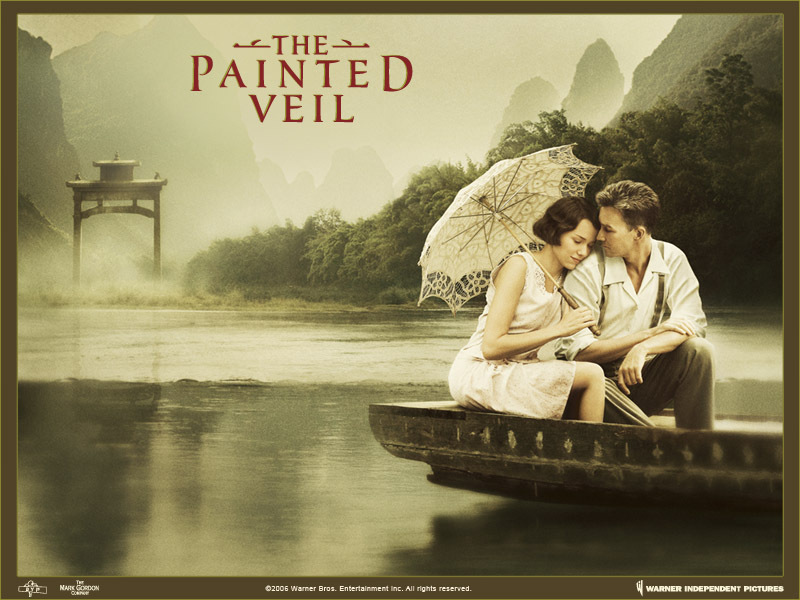 ‘The Painted Veil’ was co-produced with the Chinese governmental authorities, which means it is one of few Western films which were shot in China with an official permission to do so. But, even without knowing this information, it is clear that the movie was shot on location. The film boasts stunning views, beautiful imagery of a typical Chinese countryside. These vistas have such a lasting impression on the audience that, as Edward Norton says post-production, “China becomes a “fully realised” character in the film”. There have been a number of previous film adaptations of the novel, for example ‘The Painted Veil’ (1934) was directed by Polish Richard Boleslavsky and starred Greta Garbo. The 1934 film stayed more faithful to the novel than the present 2006 adaptation, though in 1934 film the names of the characters were changed. The 1957’s ‘The Seventh Sin’ with Eleanor Parker was also partly based on W. Somerset Maugham’s novel. However, despite the film’s great cast, the acting in that movie was fiercely criticized. In ‘The Painted Veil’ (2006), the screenwriter, Ron Nyswaner, performed an excellent job, and rightly deserves his nomination for the Independent Spirit Award in the category of the Best Screenplay. The script here incorporates all the important elements of the book. These elements are also developed further, making accents on the most interesting and dramatic moments. What is immediately evident is that ‘The Painted Veil’ is quite different from the novel. One can even say that the film is more gripping and compelling than the book, and this may be because the script goes further than the book. In the movie, Walter and Kitty fall in love in the the end, becoming very attached to each other. In the book, this is presumed, but not entirely evident. There is also a scene in the film in which Walter asks for Kitty’s forgiveness, and this is also absent from the novel. The book seems to focus more on what happens to Kitty after she returns to London from Me-tan-fu. Here, the script of the film is clever, and shows clearly Kitty’s emotional state, as she returns to London with her little boy many years after, in less than three minutes of screen time, whereas in the novel there are many chapters devoted to it. The film also shows deeper feelings developed between Kitty and Walter than the book allows it. Another notable feature of this film is, of course, its score. The music, composed by Alexandre Desplat, is absolutely beautiful and fits the picture perfectly. For this score Desplat won the Golden Globe Award in the category of the Best Original Score in a Motion Picture in 2006. There is also an ingenuous use of the beautiful and haunting ‘Gnossienne No 1’, composed by Erik Satie. The cast in this film is great. Naomi Watts is perfect in her role of Kitty and gives a terrific performance. Liev Schreiber, who plays Charlie Townsend, is also good. Interestingly enough, Schreiber and Watts got together while filming ‘The Painted Veil’ in 2005 and are still together. It could be questioned, however, whether Edward Norton really fits the image of Walter Fane. Although Norton can portray perfectly someone who is intelligent, calm, collected and shy, Walter Fane is also someone who is quite aggressive, when needs to be, and very punishing, and Norton may not encompass all the masculinity that needs to emanate from Walter. Not seen this yet but I want to now. This was a real interesting read, I enjoyed it and will definitely be checking out more of your reviews.